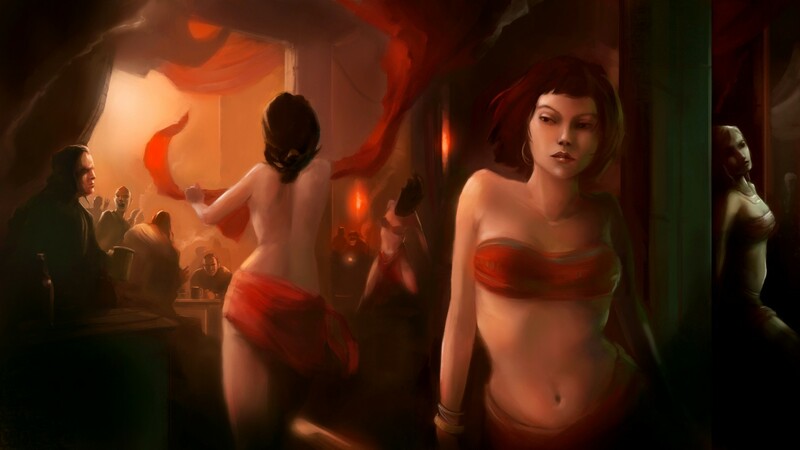 I cannot remember exactly where, or when, but it would have been early on in my game exp, when engaging in some random rp at the well with some of the girls and boys. Then on AoC Forums. From having interracted with different Rose chars I have come to appreciate the talent, wit, imagination and dedication to immersive roleplaying. I especially like the maturity that most Rose players, in my experience, have displayed. Chrysanth will be a whore, though she hopes to be called upon to practice her craft of espionage, and occasional knife work. Oh. And she promises not to steal from any of her colleagues. Not their personal possessions, at least. Her life thus far has made Chrysanth mature beyond her years, and though somewhat cynical in outlook she hasnt become hardened to people. She would probably be a good shoulder to cry upon, if a colleague needed such. Though it could not always be guaranteed that the shoulder would be a soft one. Most days of the week, though rarely during the evenings. See above. If there was an important event needing her presence I could probably manage to get on in the evening for it. Whore/shade is a fine combination to go for. Please head on over and interact with us ICly at the well, so we can get a good impression of your character. Have now met and RP'd with Chrysanth as both Talai and Ainoce now, and had a great deal of fun on both occasions.